Apple (s aapl) officially launched its much-hyped iCloud suite of services at its Worldwide Developer Conference Monday, and although the capabilities are sure to be the talk of the town among consumers, it’s Apple’s cloud infrastructure that makes it all work. Apple CEO Steve Jobs said as much during his WWDC keynote by closing with an image of — and shout-out to — the company’s new iDataCenter in Maiden, N.C. Details about the technology that will power iCloud have been sparse, but those who’ve been watching it have uncovered some interesting information that sheds some light on what Apple is doing under the covers. Will cover about 500,000 square feet — about five times the size of the company’s existing Silicon Valley data center. Cost about $1 billion to build, which is about twice what Google (s goog) and Microsoft (s msft) generally invest in their cloud data centers. Was set to open in spring after delays postponed an October launch. Is only one of two similarly sized data centers planned for the site. The other big Apple infrastructure news came in April, with reports that the company had ordered 12 petabytes of worth of Isilon file storage from EMC (s emc). It hasn’t been confirmed where all that storage will be housed — in the iDataCenter, in Apple’s Newark, Calif. data center or in the new space it has leased in Silicon Valley, or spread among the three facilities — but its mere presence suggests Apple is serious about storing and delivering files of all types. As Steve Jobs noted during the keynote, iCloud is the post-PC-world replacement for syncing everything — photos, audio, documents and more — across all your Apple devices. The company even rewrote the core MobileMe functions as iCloud apps and, much like Google with Google Apps, is giving them away for free. Despite all that storage capacity, though, Apple won’t be housing individual copies of everybody’s media files. Even 12 petabytes would fill up fairly fast with the combined audio of Apple users worldwide, which is why Apple’s focus is still on local storage for iTunes. This way, instead of storing millions of individual copies of Lady Gaga’s “Poker Face” for individual customers, Apple can house minimal copies of each individual song and sync purchased files to devices based on purchased licenses. Even iTunes Match merely applies iTunes licenses to files within users’ personal libraries that weren’t originally purchased via iTunes, rather than uploading each track into the cloud before syncing. But Apple’s cloud story doesn’t start and stop with iCloud and its related services; in fact, the cloud touches almost every aspect of pretty much every new service and feature discussed during the WWDC keynote. Every time Apple is syncing anything — from application data to system settings to media — it’s touching Apple’s new cloud computing infrastructure. That’s why Jobs highlighted the iDataCenter in his keynote and why Apple recently hired noted cloud data center expert Kevin Timmons from Microsoft. When you’re selling as many different types of devices as Apple does, the real value of the cloud is in syncing data among devices and users, and that requires a robust cloud infrastructure. Probably the most-interesting data is the news on the iDataCenter itself because of its sheer scale… nice one..
Isnt a datacenter location supposed to be kept secret? How on earth can you keep something the size of that secret? Very impressed with the presentation. I am proud to be an Apple fan. For those that don’t want to or can’t afford to upgrade their hardware and software to accommodate the iCloud shift and in turn will lose their Mac.com/MobileMe services and eMail addresses when the time comes . . . I see lawsuits flying. Apples is getting a little too Apple Centric and will have to face the those that have been paying for years. Especially in this economy. I have heard rumors already. It’ll be very interesting to see how this pans out. EMC / Data Domain storage systems of this scale have deduplication built in. So storing millions of identical copies of Lady Gaga’s latest single is not an issue; the data is stored only once (other than for redundancy) even if it represents millions of files in the filesystem. In fact, iCloud is a perfect use case for dedupe — iTunes Match will be serving up the same exact file, a 256Kbps mp3, for each and every (previously pirated or ripped) version of the song that users had on their PCs. Ooo and how mach power does it consume? Thank you! It certainly makes more sense for them to store minimal copies of each individual song rather than millions of individual copies. 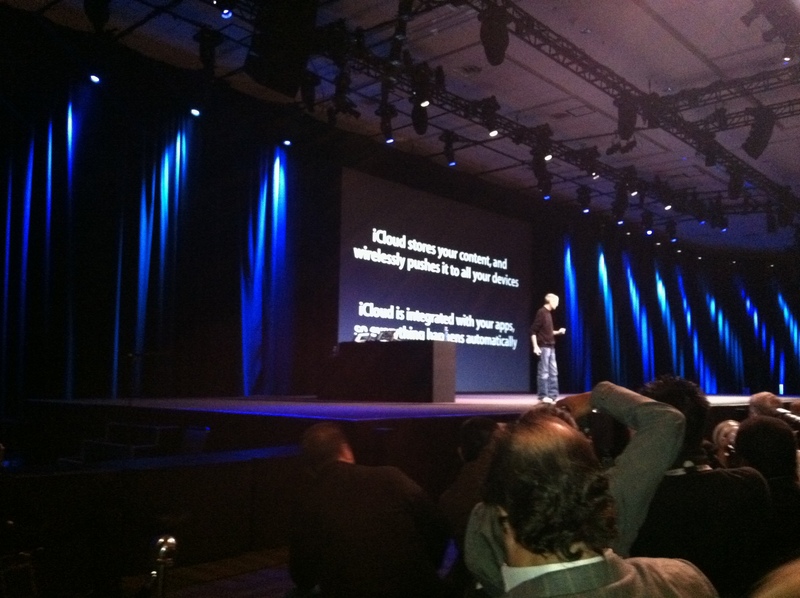 Also it definitely does seem that Apple has big plans for iCloud. However I don’t think Steve Jobs can be credited for everything. Looks like our lives are now on rental agreements. As long as you pay you can have your stuff. Documents, music etc. I am hoping this cloud thing will blow over quickly. What happens when one of these cloud companies fail? or you can not in these tough economic times afford to pay? Imagine a world were everthing is online as they would like you to believe, and the cost of using your stuff is going up and up and up. You have no control over the cost of your business. Call it the “Pie in the Sky”. That presumes that the only copy of your data is in the cloud, and I’m sure everyone would agree that’s pretty dumb. iCloud is not cloud storage, but cloud SYNCING. It’s for pushing data from one device to all other devices, not for primary storage in the cloud. As such, you should always have a local copy, but this is an easy way to make more of them without the cable. What happens when Apple’s North Carolina data center gets taken out by some catstrophic event? They are certainly mirroring all the data across diverse geographic regions. That is best practice for any kind of data center. They wouldn’t be the first to mirror tens of petabytes of information between coasts. Well, the title is a little misleading since you do not really address that. As for storage: 12PB with EMC Isilon would only be between 10 and 20 racks and evidently this place houses way more. Regarding the title, I don’t think it’s too misleading. I discussed to details of Apple’s cloud infrastructure as they were known prior to the analysis of those photos Jobs showed yesterday. Those pictures, it turns out, were worth more than a thousand words and I’ll likely address all that speculation in another post. Regarding the data warehouse, I’m not certain it’s entirely nefarious as Robin Harris seems to think. Apple also was recruiting for folks with Hadoop and data warehouse skills recently to provide analytics for its iAds service. Might that involve personal data? Sure. But to some degree that’s just the price of doing business in an ad-supported model. I don’t Apple will be selling data willy-nilly, though. I live a mile from the new datacenter. It’s massive…glad to see it going to good use! By night, Lee Yount is…. Datacentre Man! Cloud superhero of the 21st Century. A certain level of redundancy has to be available, since it would be impractical to expect a user to stream music from one master copy hosted in NC or CA if that user is in Europe. We have to ask ourselves–is the present-day network infrastructure adequate for the onslaght of petabytes worth of data we are about to shove through it? Therein lies the genius of Steve Jobs’s idea to keep data local. See comment below — I think it’s a mixed bag. What I wonder is how many people, right now, would choose to stream vs. listen locally considering that most of their devices already contain local storage and likely much of their music libraries. Steve Jobs should not be credited as a genious for this solution. Using every byte of local storage available is a much better solution than centralizing it. Anyone designing distributed processing would be foolish to ignore this. > but thatâ€™s a story for another day. This is something that can’t be oversimplified … this is a complex but probably well thought through distributed storage / distributed computing system that leverages *both* the cloud and the devices at the edge of the network. Oh, it totally leverages both, I think. Thus all the storage and the data center investment. I actually prefer local storage for media (it’s not hard to get out of wireless range when you travel outside Las Vegas and not toward SoCal), but there’s a definite value to the music-player-as-a-web-app approach. Music purchased from Amazon does not need to be uploaded by the user, it is instantly available fro streaming. However, I am assuming that Amazon still has to keep individual copies of songs for each user who purchased them, rather than streaming from one master copy.